There are a few terms that are unique to louver windows and are helpful to know. Can I have screens on my louver windows from Breezway? Yes, there are framing systems today that will allow a security or insect screen to be placed to the inside or outside of your aluminium Breezway Louvers. Following discussions with your window dealer you may choose Breezway’s aluminum hurricane rated ios Window System or we will often sell our Altair Louver Strip Hardware to window dealers who will use their own framing system. Our hurricane rated louvers have received a lot of investment in Research and Development and today are a substantially different product from “traditional” old style metal jalousie windows. If you would like to upgrade your security features, then you may consider security screens. How wide can my louver windows be? Are there standard sizes? Typically people are asking how wide a louver bay can be i.e. the length of the blades. An indicative answer is 23-5/8″ to 35-7/16″. When replacing jalousies or installing new windows to benefit from full ventilation, a rule of thumb is the higher the wind and water performance required, the shorter the blade should be. In hurricane regions the bay widths may be a maximum of 23-5/8″ or in other geographic areas with lower wind loads they may extend up to 35-7/16″. The window frame can then be designed with multiple bays to achieve the desired frame width. With Breezway’s framing systems this can be up to 157-15/32″ wide. Your window manufacturer will advise you based on your specific circumstances. There are no standard widths. However, there are standard heights and it is beneficial to stay within these standard heights. The actual standard height will vary depending on your chosen louver size and framing system. If you use a standard height all louver blades will operate. 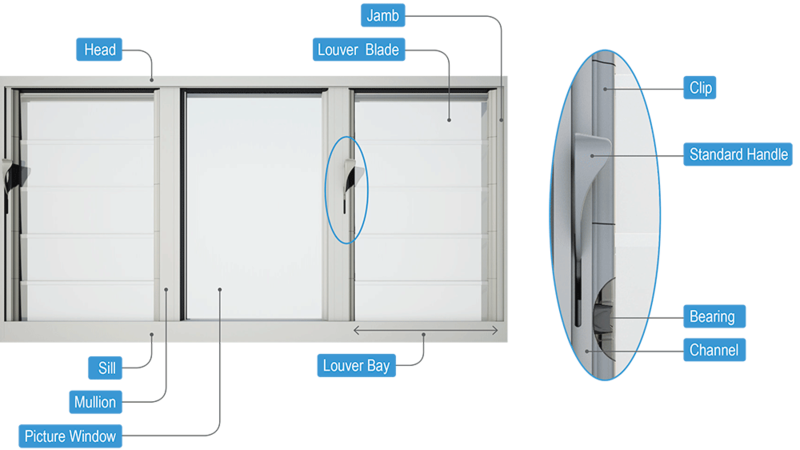 If you have an off standard height a small piece of fixed louver blade will be placed at the head of the window to make up the difference between standard heights. It is worth discussing with your window manufacturer and builder to ensure you have standard height louver windows installed. Like all marine grade windows, jalousies will need regular cleaning. The smooth outer surface of the Altair Louver clips and the quality polished edges of the glass blades do make cleaning easier. Another big plus for cleaning our louver windows is that you can clean the inside and the outside surfaces from the inside of the building. This can be a huge plus for upper story windows. What colors are available, can they match my other aluminum or wood windows and doors? In Hawaii we offer 3 standard colors with optional color matched hardware (note: Powdercoated aluminum and plastic finishes may vary slightly in color). Breezway’s range of louver windows have undergone a transformation since the 1960’s. Today our products are very much at home in premium architectural buildings. Our products are individually tailored per window and pricing needs to be done by each design. Can I customize my louver windows? With careful thought your new or replacement jalousie louvers can be much more than just a window. Consideration of control methods, blade selection and frame type can impact in real benefits such as ease of use, shading, privacy, energy efficiency, comfort, creating views, security, screening etc. Have a look at our Inspirition pages to help you decide. Some time spent now will reward you once the windows are installed. How do I buy Breezway louver windows? Breezway has a network of window dealers that ensure the product is locally available and built to meet the required Standards. How long do my louvers take to manufacture? As each order is custom made and shipped to around the Hawaiian islands (i.e. Oahu, Maui, Kauai, Molokai, Lanai and the Big Island), as well as the mainland US (including Florida, the Caribbean, St. Lucia, Antigua, British Virgin Islands, U.S. Virgin Islands, St. John, Virgin Gorda, Peter Island, Anegada, Sandy Spit, Great Harbour, Tortola, Frenchman’s Cay, Soper’s Hole, Necker Island, Savannah Bay, Cane Garden Bay, Spring Bay, Puerto Rico, San Juan, Fort Lauderdale, St. Croix, St. John, and St. Thomas), we ask that you check with your local Breezway Distributor for specific lead times on your Breezway Louver Window order. Breezway Altair Louver Windows will be assembled by Breezway or one of our approved window manufacturers and delivered as a complete window ready for installation by a builder using typical industry practices. There is some maintenance required with Breezway aluminum louvers or wood louvers. It is important to have a regular cleaning program for your commercial grade windows. You should think of the finish of your windows in a similar way as your car. Both items need regular cleaning to remove environmental contaminants and maintain paint work. This is particularly so in coastal environments. A higher performance finish may also be required in these environments. Wood blades and Powerlouvers will also require some extra care. See Care & Maintenance. Like all painted aluminum products Breezway Louvers can be vulnerable to harsh coastal environments. The componentry in Breezway louvers is aluminum, stainless steel and industrial grade plastics and will stand up well to these conditions. The powder coat finish however will need special consideration in these environments. If you are in a coastal environment, we recommend an anodized finish to our standard 25um within 1 mile of the beach. Please note, inside screens should not be used within 1 mile of the ocean. I am building in a hurricane area, will this make a difference? Yes, your window dealer will work with Breezway to make sure your luxury louvers are designed for the specific conditions on your building site. Altair Louvers from Breezway with Prowler Proof screens have been fully tested and are hurricane rated to US standards. The products have been deemed suitable for use in hurricane regions. To see feedback from our customers please visit the Testimonial page.